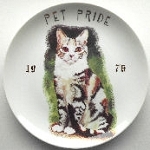 This classic guide is an excellent overview of the field of cat collectibles. 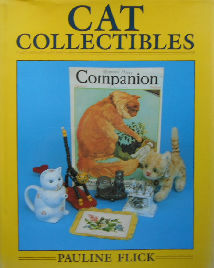 The book covers the history of cats at Christmas, on paper (puzzles, postcards & stamps), textiles, metal, glass, ceramics and more. There is a detailed index, price guide and bibliography at the back. Copyright 1992, 128 pages. Hardback, 8 3/4" wide x 11 1/4" high. Previously owned but in good condition. Note: this book weighs almost 2 pounds.